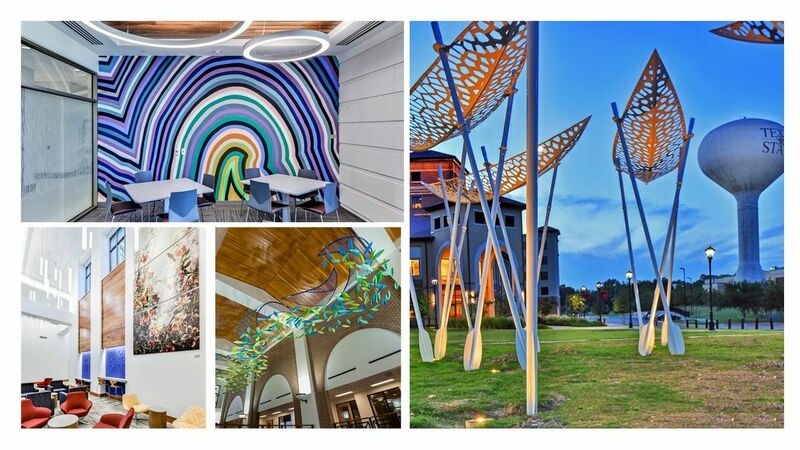 Building on a 10-year partnership, the Art + Artisans team has loved collaborating with Texas State University once again to bring art that represents the school's culture to the university's new state of the art Willow Hall, which houses the College of Health Professions on the Round Rock campus. Through imagery of willow trees, water ripples, and bobcats (a special reference to the school’s mascot) the building’s health professions program is well represented through the artwork’s symbolism and the themes of healing and calm. Through our collaboration on multiple projects ranging from academic buildings, student residences, and administration buildings, the university’s vision to enhance the student experience and reflect university culture has developed. After installing the campus’ newest sculpture by renowned artist Alice Aycock at the new Science and Engineering Building, our team is looking forward to installing an exciting monumental, interactive sculpture for the freshly renovated Events Center and later this fall! You can experience the transformative power of our partnership in this incredible video! Each standing 22 feet tall, these eight canoe sculptures are made from water-cut aluminum and stainless steel and cast changing shadows throughout the day. Featured on the lawn of Angelina Hall, one of the university’s newest student residences, the sculpture provides a gathering spot for students to meet and connect. At night, dramatic uplighting transforms them into a beacon. The monumental icons speak to the school’s engrained river culture. The selected sculpture is a reflection of the natural river environment of the San Marcos region, as well as a metaphor for students’ journeys at the University and beyond. You can see the vessels’ intensive installation process and the project’s final results in this time lapse video! Drawing inspiration from the nearby river, this artwork is a sculptural installation for a residential housing courtyard at Chautaqua Hall. The pieces are translucent during the day and at night turn into a bioluminescent landscape with bright neon colors. Known campus-wide, the iconic sculpture encourages student body interaction, as multiple hidden buttons that change the sculpture’s colors are located within. This mobile sculpture is suspended in the two-story atrium of Gaillardia Hall. The suspensed artwork is composed of eclectic blue and green aluminum leaves that are seen as drifting and apart of the flowing river above, due to each individual leaf that rotates 360 degrees. Not only inspired by leaves floating down the San Marcos River, but the installation is also symbolic of the student’s individual journey through college, while still remaining a member of the great student body. A grand exterior sculpture provides the focal point for the meditative garden at Sayers Hall. This majestic piece, by an internationally renowned artist, is an abstract tree of bronze and steel which evokes nature, wisdom, and mystery, while providing both students and the public with a special place to reflect.